Discover the highlights of Buda a take a histroric travel back in time in the Memento park! In the first part of the tour we visit the Memento Park located 10 kilometers from the city center. During the outbond trip we cross Liberty bridge and riding alongside Buda riverbank we pass by a few famous bulding such as the Great Market Hall, the Gellert Bath, The University of Technology buliding with the 56 revolution monument, The National Teather and the Palace of Arts. During the tour in the park we take you on an exciting travel back in time to the era of the communist dictatorship. We walk around the 42 original giant statues - among them Stalin's boots, Red Army soldiers, Marx, Engels, Lenin etc - once stood in the city during the communist era, tell you what was the life like behind the „Iron Curtain”, how the political secret service used to work, and about the 1956 revolution. You can also experience what it is like to sit in a Trabant the infamous East German car make. After this particular tour we return to the city center and explore the historic Buda Castle. View the iconic Matthias church and enjoy the spectacular view from the Fisherman Bastion. Take a short tour in the cobbled stone alleys, than take a short walk at the Royal Palace courtyard and enjoy the magnificent view from the terrace. We will also view the „White House” the official residence of the Hungarian President and if you are lucky you may even a see the changing of the guards here. 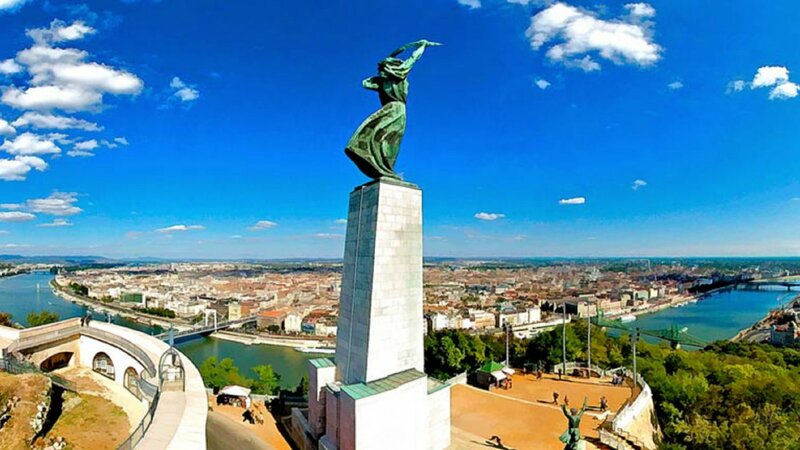 At last we drive to top of the Gellert Hill and take a final stop to view the Citadel, the Liberty Statue and to enjoy the breathtaking view of Budapest. Why have only the boots of Stalin left? How did a water polo game turn into a freedom fight? Why did common Hungarians have 2 passports? Why did you have to wait years for a car ? What made a pair of blue jeans cost a month salary? Why pig killing used to be done during the night? What was the first american product to you could by in Hungary after the WWII? Why banana was only eaten during Christmas? This recently opened cultural center was constructed from a row of old warehouses by the river Danube covered by a whale shape special glass roof . The building was recently used as a movie spot, it appears as the NASA HQ in the movie "The Martian". The oldest university in Budapest established in 1782 . The eclectic style main building on the riverbank is one of the most remarkable buildings on the Buda side. One of the most popular music and concert venue not only in Hungary but also in Europe. The modern building along with the next door Palace of Arts is the most renomed and newest cultural center of the city. An extravagant illumination makest even more attractive after dark. The largest and one of the most renomed concert hall of Budapest. After dark it is beautifully illuminated along with the next door National Theater. The Castle Garden Bazaar (Várkert Bazár) is a recently restored neo-Renaissance building on Buda riverfront built in 1883 according to the plans of one of Hungary's great architects Miklós Ybl. The Fisherman Bastion is one of the most fascinating sights on Castle Hill. Although fishermen from Watertown (Víziváros) reputedly defended this part of the city during the Middle Ages, Fishermen’s Bastion was built in the 1890s and it’s purely decorative. Today, it's a favorite lookout.